There are 6 main steps involved in calculating the circumference (and radius) of the Earth. Click on each step for full information. You may find our worksheet helpful in recording each step. Step 1) Measure the length of the shadow cast by a gnomon at local solar noon. For MYW, this will be done with your Partnership in each of three locations; United States of America, Chile, and Mexico. Report this online! Step 2) Determine the angle of the shadow in each location, called the gnomon-sunbeam angle. Step 3) Determine the "vertical angles" by combining (either adding or subtracting depending on the latitude) the gnomon-sunbeam angles at pairs of locations from your MYW Partnership. Step 4) Determine the separation distance between measurement locations projected over the zenithal circle. This can be found using the online distance calculator. Step 5) Calculate the Earth’s circumference (and radius) using the vertical angle (step 3) and separation distance (step 4) between locations for each pair of locations. Step 6) Average the Earth’s circumference (and radius) values for each pair of locations you calculated to get a final value for the Earth’s circumference and radius! Report this online! The vertical post which casts a shadow is called a "gnomon". This term comes from sundials; the object that casts a shadow on a sundial is called a gnomon. Make sure you record the local time at which your measurement was made. Make sure you can determine the latitude and longitude for the location at which your measurement was made. Make sure you record both the height of your gnomon and the length of its shadow. Make sure you report your shadow measurement(s) for each day that you make the measurement. There are two ways to do this: using graph paper and a protractor, or using some basic trigonometry. The two figures below show the geometry of a gnomon, sunbeam, and shadow in two different locations. We will refer to them throughout the following descriptions. You will need your measurements of the height of your gnomon and the length of the shadow that was cast by the gnomon. Draw a line on the graph paper to represent the gnomon. Pick a scale that fits on your paper. You will need to use the same scale for your gnomon and for the shadow. For example, if your gnomon is one meter long (100 cm) and the line for it you draw on the graph paper is 20 cm long, your scale is 1/5th. Draw a line on the graph paper perpendicular to (at a right angle, 90, to) the gnomon line, extending from one end of the gnomon line. This line will represent the shadow. Use the same scale that you used when drawing the gnomon line. For example, using the example numbers from step 1 above, if the actual shadow was 45 cm long, the line representing it on the graph paper should be 9 cm (1/5th of 45 cm) long. Connect the tips of the gnomon line and the shadow line on the graph paper with a third, straight line. You should now have a triangle (a right triangle, in fact!). Look at figures 1 & 2 above. 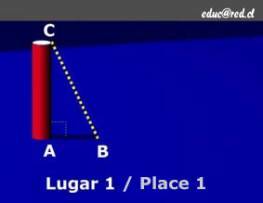 Label the corners of your triangle with the letters A, B, & C in the same way they are labelled in figures 1 & 2. Use your protactor to measure angle ACB. Refer to figures 1 and 2 above. The goal is to find angle ACB. We know the length of the gnomon (or line segment AC) and the length of the shadow (line segment AB). 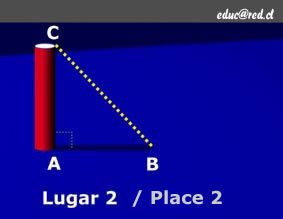 We also know that the gnomon is vertical, so angle BAC is a right angle (90°). We'll use the Greek letter phi (φ) to represent the size of angle ACB. If the two locations are in different hemispheres, we add the two angles together to get the "vertical angle". If the two locations are in the same hemisphere, we subtract the smaller angle from the larger one to get the "vertical angle". In the case of the Measure Your World project, most locations will be in Chile, Mexico, and the U.S.A. Locations of Angle Measurements How to Calculate "Vertical Angle"
When Eratosthenes used this method to find the size of Earth, he had several things going for him that made the calculation relatively easy. One of the two locations he used, the Egyptian town of Syene, is on the Tropic of Cancer... so the Sun was directly overhead there on the solstice, casting no shadow, and thus the angle of the gnomon's shadow was zero. The two locations Eratosthenes, Alexandria and Syene, have approximately the same longitude... Syene is almost due south of Alexandria. Finally, on the solstice, two places with the same longitude experience solar noon at the same time... further simplifying calculations. In your case, we have provided you with a calculator that will determine the "correct" distance between two places at which you are making sun angle measurements. You will need to supply the calculator with the longitudes and latitudes of the two places your are comparing, and the times and dates when you made your sun angle measurements. The calculator will determine the "correct" distance between the two places. Click the calculate button. The calculator will give you the "correct" distance between the two places; record this number - you'll use it in Step 5 below. Do this for each of the three pairs of places where your group is making measurements. D and θ are known; you'll need to solve for C.
You should do the calculations described in step 5 three times; once for each pair of locations (Chile & Mexico; Chile & USA; and Mexico & USA). Since it extremely unlikely that your mesurements were all perfect, the calculations will likely result in three different values for Earth's circumference. To get a single value of the Earth's cirucmference for your team, average the three circumference values. Report your final calculation of the Earth's circumference and radius to us!